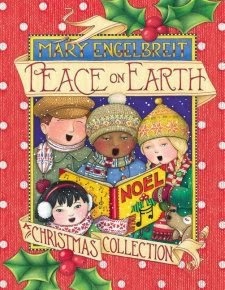 Mary Engelbreit's Peace on Earth: A Christmas Collection is a beautiful, full-color picture book. Mary's timeless illustrations capture the true meaning of Christmas, and the poems, stories, quotes, carols, and verses combine to create a true keepsake. Peace on Earth is the kind of book you can pick up and read again and again. It is not a start-to-finish story but rather a compendium of short readings. I love books like this to read during the holidays with my children. If you only have a minute or two of time, you can read a complete section and fill yourself up with Christmas cheer. carols such as "The First Noel" and "Silent Night"
Mary Engelbreit's familiar vintage-style illustrations depicting Bible scenes and modern-day children. I would recommend Peace on Earth for all ages. As a Mary Engelbreit fan, I had to restrain myself from pulling pages out to frame. But my son has already claimed this book for his own!